i just spent last night making a zillion different types of chocolate & vanilla cupcakes for a bridal shower i am off to shortly. okay, by a zillion i mean four dozen, but EH that is a lot of cupcakes! i have been trying really hard to perfect my rose piping technique (spoiler alert: you will see the results this week). i don't know, i feel like it still doesn't look exactly how i want it to.. maybe that is just me being a crazy perfectionist. i really want to work on my skills so i can make both a ruffle cake & ombre rose cake! but enough about piping & more about these parfaits. this is kind of a little intro to spring/mother's day, even though it snowed yesterday & looks like it is christmas outside. every year since i was little, my sisters & i have made my mom breakfast in bed. what started out as burnt toast & orange juice, slowly progressed to a much fancier breakfast. bobby flay's blueberry pumpkin french toast (i need to blog those ASAP), nigella lawson's strawberry cheesecake pancakes & various forms of fruit parfait! this parfait has been the best one to date. not only is the honey granola homemade, but i decided to roast the strawberries in honey & they are amazing. i can't believe i didn't always do this. with the help of bee raw's variety of honey, i decided to include the different honeys in ALL three layers of the parfait. i chose a very simple almond granola base & went with a plain greek yogurt sweetened with honey. in a large mixing bowl add oats, almonds, cinnamon & nutmeg. stir until combined. in a separate bowl whisk oil, honey, vanilla & milk. set aside & let cool. in a bowl toss strawberries & honey. pour onto a parchment lined baking tray. roasted for 10-15 minutes, until strawberries become soft & juicy. in a bowl add yogurt & honey. stir until evenly mixed. 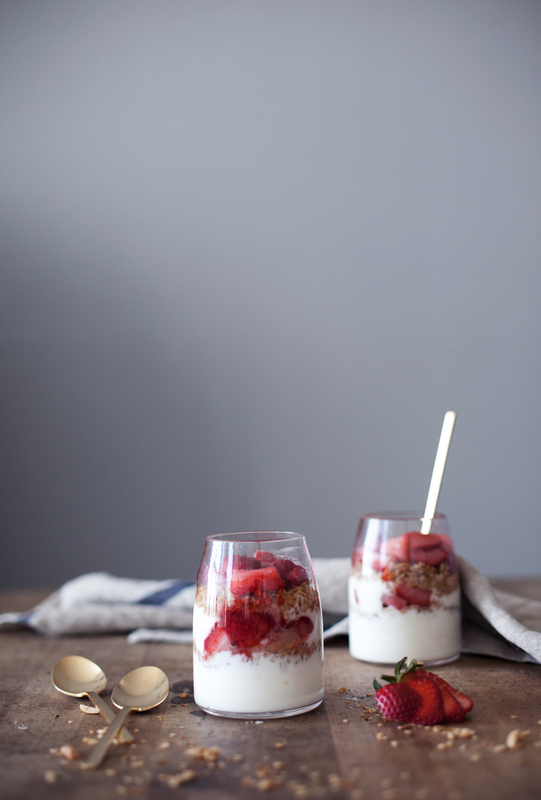 in a clear glass or parfair dish layer yogurt, granola & strawberries. repeated until you reach the top of the glass. this post was created in partnership with bee raw. they have so many unique flavours of honey, i seriously want them ALL.